Rapid-quench kinetic analysis has become the method of choice for examination of enzyme reaction pathways. The KinTek RQF-3 Quench-Flow Instrument enables the most definitive experiments to be performed most efficiently, preserving precious biological samples and providing accurate, reliable data. The KinTek RQF-3 has become the international standard for analysis of enzyme reaction mechanisms. The unique features of the KinTek RQF-3 enable unprecedented studies on DNA polymerase mechanisms where the need for performing single turnover experiments is especially significant and minimal volumes are required to conserve the expensive synthetic oligonucleotide substrates. The KinTek RQF-3 Quench-Flow Instrument uses a computer-controlled servo motor drive, which provides a precise and reproducible setting of reaction times. A significant advance over stepper motor technology, the high torque, low inertia, brushless servo motor and high performance, the digital power supply provides essentially instantaneous starts and stops of the drive syringes. No other quench-flow provides such performance. Coupled to a unique, precision valve system, the KinTek RQF-3 provides unparalleled ease of use and reliability. Even "four syringe" type experiments involving three mixing events and two programmed reaction times (Double Delay Quench) can be achieved using the computer-controlled motor drive — without the complications of four drive syringes! Which has been a standard feature of our instruments for over a decade. The unique valve arrangement of the KinTek RQF-3 allows samples to be loaded into the 15 microliter sample loops via a three-way valve. The reactants are then forced together through the delay line by buffer from the drive syringes. This valve system allows efficient sample loading so that 20 data points can be collected from 300 microliters of each reactant, with no waste! Larger sample loops can be used, or samples can be loaded into the drive syringes to get up to 5 ml in a single shot. In order to obtain different reaction times in a range of 3-100 milliseconds, it is necessary to use delay lines with different lengths. In other quench-flow instruments, this is a tedious task. In the KinTek RQF-3, a novel 8-way valve is used to select each reaction delay line by simply rotating the valve. The computer-controlled motor drive is then set for the precise drive speed to achieve the desired reaction time. The two reactants are first mixed in the valve, flow through the selected delay line and are then mixed with the quench solution and flow out of the instrument into a collection tube. The KinTek RPL-3 Rapid Optical Flash Photolysis Chamber replaces the 8-way valve with an optical flow cell as shown at left. In this arrangement, the samples are mixed into the flow cell where the reaction is paused for the desired time. After this time, the computer triggers an external light source (This source can be almost anything. KinTek Corporation has built photolysis chambers utilizing many light sources, including flash lamps, lasers, and even synchrotron radiation!) to irradiate the mixed sample in the flow cell. The KinTek RPL-3 Rapid Optical Photolysis Chamber is based on the KinTek world leading RQF-3 Rapid Quench-Flow Instrument and mounts to the same drive system. Which allows the customer to have both an RQF-3 Rapid Quench-Flow and an RPL-3 Rapid Photolysis Chamber at a very affordable price. The 3-way valve is used to connect the sample loops either to the flush line, the sample load syringe or the drive syringe containing the buffer. This method enables efficient sample loading and flushing with no waste of sample between runs. The flush-load-collect cycle can be completed in less than two minutes so that an entire course time consisting of 20 data points can be collected from less than 0.4 ml of solution in less than 45 minutes. The KinTek RQF-3 is entirely under computer control, making the operation of the instrument easy and convenient and allowing the operator to concentrate on the sample collection and analysis. Simply input the desired reaction time, and the computer sets up the servo motor and tells the operator which reaction loop to use. 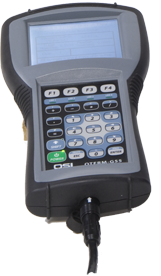 Because quench-flow experiments often involve the use of concentrated acids or bases and radioactive materials, the KinTek RQF-3 uses a sealed keypad with an LCD display. Thus, the computer interface is protected from the harsh environments necessary for performing the experiment. The keypad can be washed with mild soap and water at the end of the experiment to eliminate contamination. Computer-Controlled Servo Motor Drive System for Smooth, Reliable Performance. Kinetics Response Time: Shortest reaction time 2.5 milliseconds. Minimum Sample Volume: 15 - 20 microliters per sample per shot. Maximum Sample Volume: 5 ml per sample per shot. Syringe Volumes: 5 ml standard. Syringes of 0.25, 0.5, 1.0, 2.0 and 10.0 ml volumes are also available. Temperature Range: 4 - 70°C range of temperature is maintained by circulating water bath (not provided).